@petershankman | New PR Words - and Music! Welcome to Tuesday Tweets for August 23, 2011 — where we take a look at tweets from my Twitter feed for do’s, don’ts, best practices – and sometimes just for fun. Keep in mind that what we examine here is in no way personal. We’re all learning about building audiences online. In that spirit, if you disagree with my assessments, let me have it! I’m learning, too! This is a typical booster tweet – similar to #followfriday (#FF) but for any day — to promote people whose tweets we find of interest an with whom we’d like to build stronger relationships. Even though it seems like a time saver to string a bunch of Twitter handles together as in the above example, it’s actually more useful and powerful to do one at a time and include something about why we should follow that person, who they are, what they do, what they share. If you have two people who have similar reasons to recommend them you can send them both. But let people know why. Since the 5.9 magnitude earthquake struck the east coast of theU.S.an hour or so ago, my Twitter timeline is full of earthquake tweets. So I’m going to give in and dedicate the rest of Tuesday Tweets to the best of the earthquake tweets that are coming in. Hope you didn’t get too shook up. The windows rattled here and the building shook a bit, but fortunately it looks like there were no serious consequences. My local daily paper seeking citizen journalists to help them report on the earthquake. @muz4now stan stewart The D.C. area quake was powerful enough (5.8) to rattle my chair in the Poconos at 2PM Eastern. Wow. Haven’t felt that sinceOakland. This poor guy thought he’d escaped earthquakes when he moved east. Good one. Hope it’s also dry. Anyone have other Martini references? @typeamom Kelby Carr Did the CNN anchor seriously just suggest the quake could have possibly been terrorists? Oh my. @petershankman Peter Shankman So bummed I don’t have any pressing deadlines I can miss by blaming the #earthquake. I felt the same way. Though I was sorry it cut into Dan Zarella’s HubSpot webinar at 2. Love an old saw brought out at the perfect moment! And today I’ll end with my own contribution to the #earthquake discussion, which was the number one trending topic on Twitter this afternoon. The recently adopted Tuesday Tweets graphic is from Freshalex Online under Creative Commons license. Twitter Is Still So Interesting. Love It!! 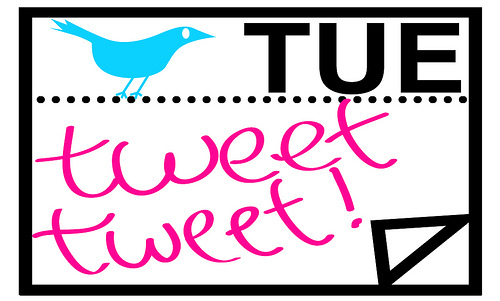 Welcome to Tuesday Tweets for August 2, 2011 — where we take a look at tweets from my Twitter feed for do’s, don’ts, best practices – and sometimes just for fun. Keep in mind that what we examine here is in no way personal. We’re all learning about building audiences online. In that spirit, if you disagree with my assessments, let me have it! I’m learning, too! This tweet comes under the, “Why Twitter is fascinating” heading. Any day on Twitter can take you to a place you’ve never been before. This tweet introduced me to crowd-sourced poetry. It comes right out of the moment and the news. The link takes you to a poem using keywords sourced from the poet’s Twitter stream about the U.S default crisis, which has been a trending topic on Twitter for awhile. Regardless of political point of view or quality of poetry it shows the creative uses people are making of Twitter. This tweet makes me scratch my head. It’s brilliantly lazy. Someone bothered to do a word count on this url – which contains a description of the subject matter shared by the link. It’s 139 characters so they didn’t have to shorten the link or write tweet content. First time I’ve ever seen this. @petershankman Peter Shankman #NASA Administrator Bolden just told us whyAmerica is still HUGELY involved in space. I’ll break down his answers into 140 chars soon. Here’s a tweet from Peter Shankman who founded and sold HARO (Help a Reporter Out) a service that connects journalists to expert sources. Peter started tweeting under the handle @skydiver. The fact that he now has his own name as a handle makes a statement about how Twitter has evolved into a serious business tool. This is an in-the-moment tweet Peter put out from an event he’s attending. As the social media guru that he is, Peter used the tweet to share a piece of info while publicizing future tweets he’ll put out to share more info from the event. I’m interested in the future of NASA and especially any positive news about our involvement in space – so I’ll be looking for Peter’s additional info. I clicked on this because as a foodie and home cook I’ve always had a fantasy about being a Food Network star – and I’m also getting a little hungry. I’d propose a show about five-minute meals you can put together between writing blog posts and feeding cats. More tweets next Tuesday!!!! Aren’t you even tempted to share a tweet or two of your own in the comments?